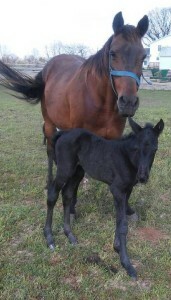 Black Beauty was born to Itty Bit May 1, 2015! May is here already. It seems as though 2015 just began and now we are already in the month of May. The first of May brought some excitement here. Our horse Itty Bit gave birth to a little filly. She is all black, so we named her Black Beauty. Such a lively young foal! Itty Bit is a very protective mother to the foal and it took some time for her to let us get too close to the foal. 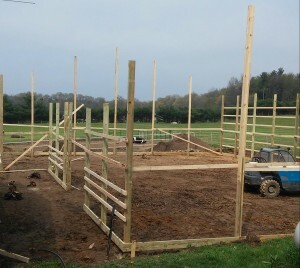 Framing went up on a new pole building, with the help of a contractor. 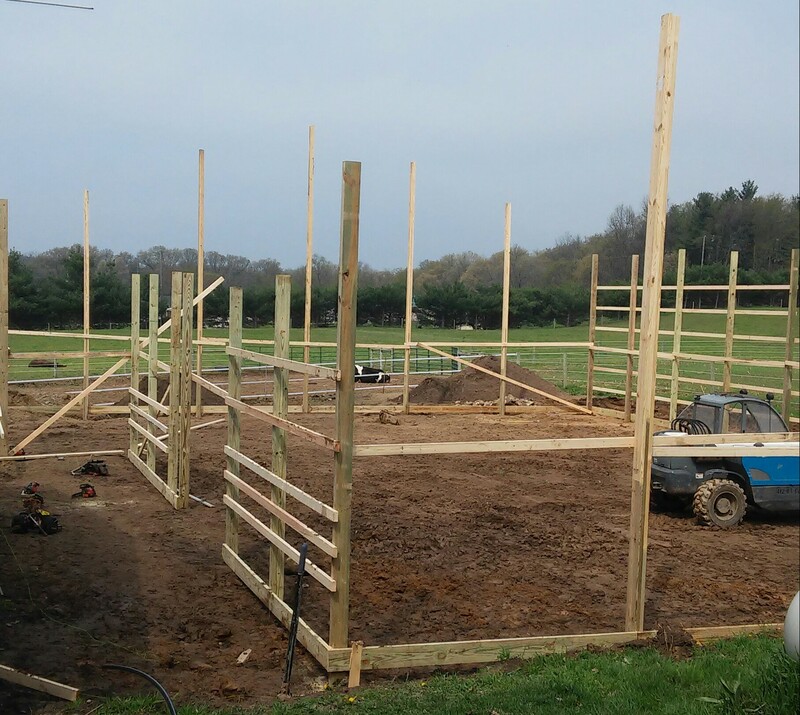 The construction crew started building our pole barn this morning. The poles are all set. Daughter Verena didn’t have to work today so she made chocolate chip bars and lemonade to serve to the men for their break. My rhubarb is ready to use and I need to make rhubarb custard pie. My husband Joe always likes that. Joe found out yesterday that they will soon be working nine hour days on Saturdays for a while. This makes him glad he hired help to put up the pole barn and didn’t attempt to put it up himself. Last week I bought the royal blue material that I need to make address for nephew Levi’s wedding next week. I want to cut it out today and start sewing on it. I was so glad Verena could have the day off to help with the other work. Our sympathy goes to Elizabeth’s special friend Timothy and his extended family. His grandpa died yesterday. The funeral is planned for Friday in northern Indiana. We have radishes, peas, and corn up in the garden. We also have sweet onions planted. We had a few rainy days so once the garden dries off again we would like to plant some more of the garden. Our horseradish plant is looking nice. We want to make horseradish sauce. We grind up the root real fine and season it. Son Kevin, 9, and Lovina are enjoying their ducks and amazed at how fast they are growing. I haven’t been out to the barn lately to see how big they are. Kevin is getting annoyed with our new rooster. He said this rooster is starting to get mean like the old one. Thursday evening we will go to the middle school orientation with daughter Lovina, 10. Lovina and her classmates will present their career prep portfolio exit interviews to the parents. It doesn’t seem possible that number seven of our eight children has reached middle school level. Saturday we attended the annual consignment auction. We sold our pony Tiger at the auction. Susan really hated to see him be sold but we have too many ponies around. We gave our miniature pony Minnie to Jacob and Emma’s son Steven. Lovina and Kevin are almost too big for her. Susan is training Minnie’s colt Prancer. She says he is easy to train. It looks like we need to get the yard mowed. With the rain, the grass is growing fast. 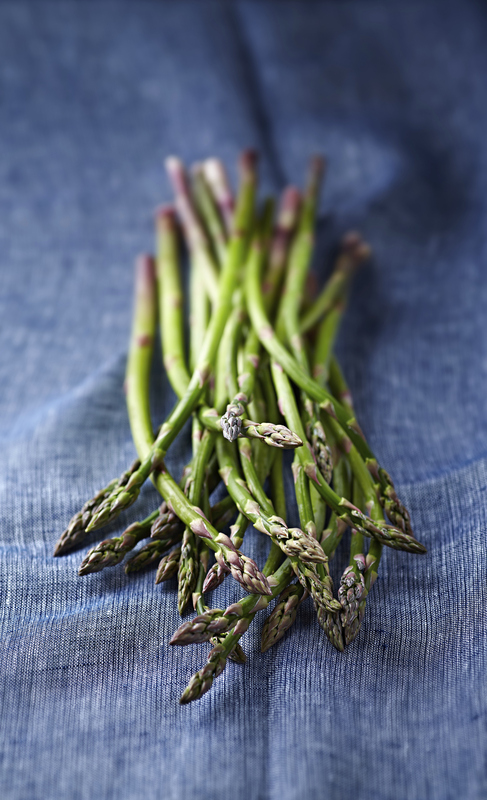 We are enjoying asparagus fixed in different ways. Try it in this recipe. God bless! In a skillet, cook asparagus in a small amount of water until tender-crisp, about six to eight minutes; drain well. Spread about one teaspoon of mustard on each ham slice. Top with one cheese slice. Place one asparagus spear on each piece of cheese (trim to fit if needed). Roll up each ham slice tightly; secure with three toothpicks. Dip ham rolls in egg, then in bread crumbs. In skillet, heat one inch of oil to 350°. Fry rolls until golden brown (about three to four minutes). Drain on paper towels; keep warm. Cut each roll between the toothpicks into three pieces. How about Blackie for colt name..